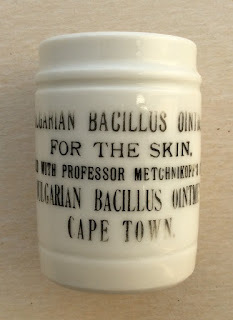 This overglaze porcelain type ointment pot is not strictly a Victorian pot as it dates from around 1915. The company is listed in the directories in 1913 as based in Cape Town. The contents size of 30 (ml) is embossed on the underside. book produced by Messrs Houghton & Priestley page 57.